Specializing in kitchen and bathroom renovation, we are a one-of-a-kind remodeling company dedicated to providing the highest quality service available in the industry. Quartz slabs of 95% granite/glass and 5% polymer provide the best surfaces available in the world! 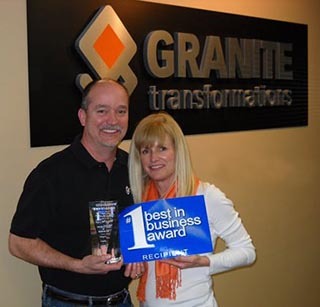 Whether your needs are residential or commercial, you can count on Granite Transformations for speedy, affordable and professional work, every time. Products we work with include granite, stone, glass counters and mosaic backsplashes and we offer them all in a wide variety of colors and patterns. We also take pride in our green building practices using recycled materials and generating less waste with our demolition-free countertop installation process. Call today for a free in-home consultation where we bring these exciting products and colors to you!